Frederick Charles Beiser, professor of philosophy in the College of Arts and Sciences, has been awarded one of Germany’s highest civilian honors. 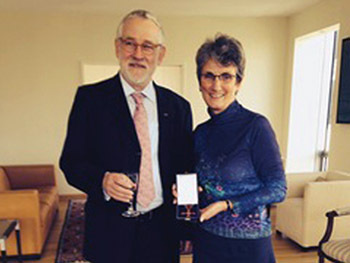 Last month, he was presented the Cross of the Order of Merit of the Federal Republic of Germany (Bundesverdienstkreuz) by German Consul General Brita Wagener at a special ceremony in New York City. The award was given to him in recognition of his lifelong dedication to engaging American students in the study of German philosophy. Among those in attendance were Beiser’s wife and daughter; Karin Ruhlandt, dean of A&S and Distinguished Professor of Chemistry; and Zachary Braiterman, professor of religion and director of the Jewish Studies Program. An Arts and Sciences faculty member since 2001, Beiser is also interested in Early Modern and 19th-century philosophy, including the Enlightenment. Prior to Syracuse, he spent more than a decade on the faculty at Indiana University Bloomington, and served brief stints at other institutions, including Harvard, Yale and the University of Pennsylvania. A common thread throughout Beiser’s career has been the desire to promote German philosophy to English-speaking students. A tireless proponent of study abroad, he says it is important for American students to see, first hand, how Germans approach their own philosophers. Beiser says that receiving the Order of Merit marks the culmination of work that began more than 40 years ago at Oxford, where he earned multiple degrees, including a B.A. and D.Phil. Since then, Beiser has received many accolades, including Harvard Press’ prestigious Thomas J. Wilson Memorial Prize and various teaching awards from IU and the University of Colorado Boulder. He also has been awarded research fellowships from the Guggenheim, Humboldt and Thyssen foundations, as well as the National Endowment for the Humanities. His current research involves the rise of German anti-Semitism and the ensuing controversy over Jewish emancipation at the end of the 19th century.